Hair transplants by specialized a hair transplant doctor can create a very natural appearance. Hair transplants have an extremely high success rate and side-effects are rare. However, some myths about hair transplants persist. Here are the facts, provided by Dr. Shapiro. 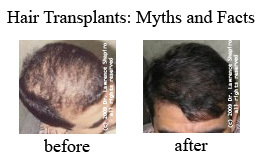 Myth: Hair transplants are suitable only for people with serious scalp problems. Facts: Hair transplants are frequently used to treat the most common type of balding, male pattern balding, which is hormone-related. Hair transplant doctors can also address most types of female pattern balding, bad face lifts and bad brow lifts, and serious scalp problems. Myth: Having a hair transplant would require me to find someone to donate their hair. The hair might be rejected. Facts: Hair transplants utilize your own hair. 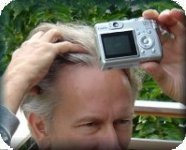 In the case of male pattern balding, the hair on the back and sides of the head is quite suitable because it is less sensitive to testosterone, and therefore not likely to fall out. Under local anesthetic, a strip of scalp is removed, and the hair follicles are carefully transplanted to the balding areas. It is rare that the transplanted hair has any difficulty, and it is not subject to rejection, because it is your own hair. Myth: Transplanted hairs look like doll hair: plugs. Facts: In the early 1990’s, Dr. Shapiro, a hair transplant doctor with offices in Boca Raton and Hollywood, Florida, developed special blades and techniques for inserting small follicular units (FUT) into the balding areas. Instead of the large bundles of 5 – 8 hairs, he used 1 – 3 hairs, to create a much more natural look. Examples. Myth: Hair transplants are only for rich people. Facts: The cost of high-quality hair transplants by a skilled hair transplant doctor can be very reasonable. Dr. Shapiro charges as little as $3 per graft, and has financing options. Some clinics hire salespeople and don’t do enough hair transplants to cover their overhead easily, so they charge more. With hair transplants, you don’t necessarily get what you pay for, so make sure your hair transplant doctor specializes in hair transplants, lets you see an actual, live procedure and talk with the patient, and has lots of satisfied patients you can meet in person. Also, make sure that the doctor will do lots of grafts per sitting. If you start to hear $8K or more per sitting, check in with Dr. Shapiro for a more reasonable price and the best treatment. Myth: Everyone will know I had a hair transplant. Facts: After a hair transplant by a skilled doctor, there are no bandages. Dr. Shapiro trims the transplanted hairs so it takes about 3 months for growth to be noticeable. The changes are so gradual that most people who know you won’t notice anything specific, but they might mention that you are looking great! A good hair transplant doctor utilizes the latest follicular unit graft techniques to create a natural look. New people you meet will likely never suspect you had a hair transplant if you utilize a skilled hair transplant doctor such as Dr. Shapiro. This entry was posted in Hair Loss, Hair Transplant, Hair Transplants on December 10, 2009 by Larry Shapiro.